House of Champions! Flying High! No more stalking the AKC website! Bailey’s championship rounds out the Cardi household and now we are a house of Champions! 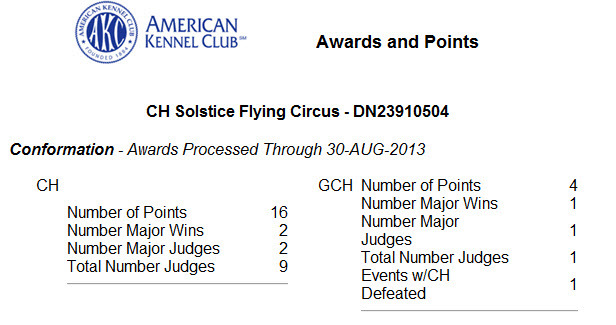 PJ, Frost and Bailey all have points toward their Grand Championships so we will be working on those during the fall and winter and we are also starting some classes to work on some of our companion titles. Mostly we are having a good time and there are so many doggy activities around our new home that we can stay busy with new things like CAT lure coursing and Barnhunting and Tracking, along with Agility, Obedience and Rally. I am so enjoying living 4 minutes from the Atlanta Obedience club where I have recently become a member and just 15 minutes away from the Lawrenceville Kennel Club building (where I am applying for membership) so that there are year round classes available. Just in case you are wondering, all of my cardigans have some “flying or flight” reference in their name. I love airplanes and flying. I had the great privledge of working for the Amigo Airsho in El Paso, TX for about 10 years and it afforded me lots of opportunity to enjoy the world of flight. I traveled to some wonderful place and watched some very talented flyers and because of that I like remember them and keep my Cardigans flying. Are you aware that the Cardigan Breeder’s listing brings up your old Soltice site in NM? I tried it twice and it has your New Mexico address. Fortunatelly, Your new site is on my computer. Hal, I have to get the http://www.solsticekennels.com updated, thanks for letting me know.